Update with tweets from Uber CEO Travis Kalanik, at the bottom of this story. 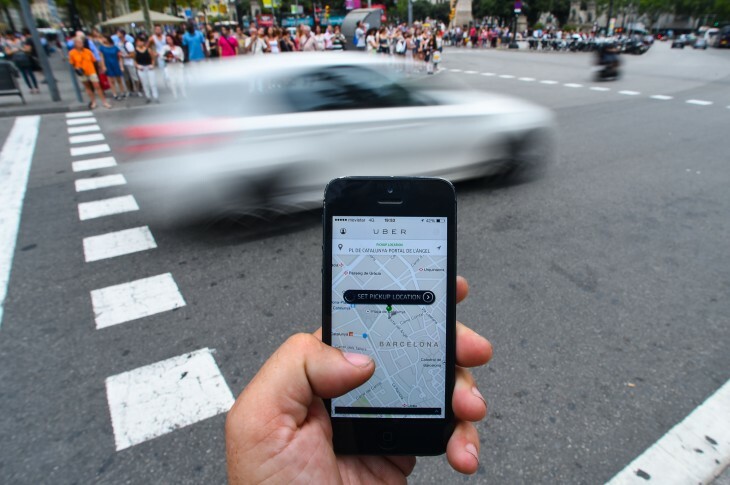 Recently, CNN shared data from Lyft that showed Uber had ordered and canceled over 5,500 Lyft rides over the space of ten months. After swiftly denying the rumors, Uber claimed that Lyft has been using the exact same tactics on its service, cancelling 12,900 rides. When Uber denied the claims, it said that they were “patently false” because its riders and drivers recruit users rather than the company itself and that it doesn’t cancel rides. It appears that Uber doesn’t intentionally cancel rides, but it does do something worse. Brand Ambassadors that are hired into the company under the idea that they will be helping spread the word about Uber in their cities are actually used in an attempt to subvert Lyft. A piece published by The Verge today shows that members of a special “SLOG” team are selected to receive an Uber-owned iPhone and credit card for the purpose of creating fake Lyft accounts (using disposable phone numbers) and using them to order rides on Lyft with the goal of recruiting drivers. The document below, sent to us by a source last week, details how the program (nicknamed “SLOG”) works. 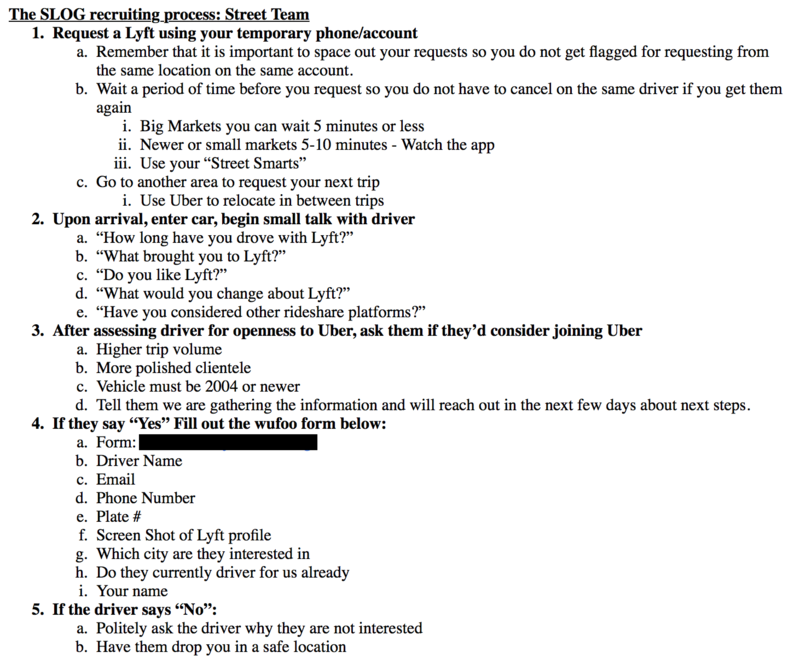 The street team is instructed to order a competitor’s car using their temporary phone, then should assess the driver for openness to Uber before asking them to join the company as a driver. If successful, the brand ambassador is required to enter the driver’s details online so that the company can contact them to follow up later. 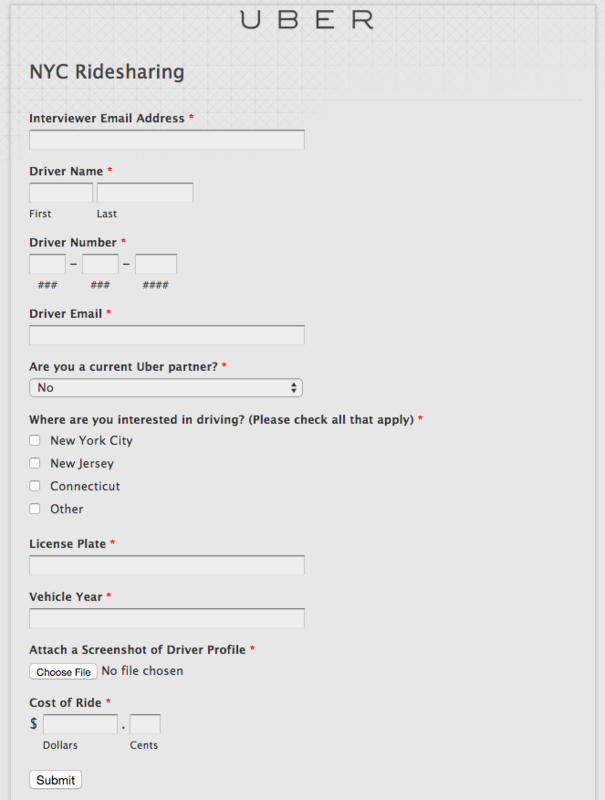 The form below is an example of one used by the Uber SLOG team in New York City, which asks SLOG team members to screenshot the Lyft driver’s profile. Uber downplayed the accusations by The Verge in a blog post this morning, saying that “riders and drivers help recruit new drivers to the Uber platform” but stopped short of owning up to the true nature of the SLOG program or the fact that it specifically targets Lyft drivers with Uber employed staff. Another form ambassadors are required to fill out, pictured above, specifically asks if the driver is affiliated with Lyft or not. Ambassadors organize their activities over a service called GroupMe, where they are occasionally assigned sectors of cities to order drivers and bragging about their conversions occurs between team members. The program isn’t isolated to any particular location, either, with documents indicating that brand ambassadors are able to request burner phones in multiple cities across America. While researching the SLOG program, we had trouble getting further sources willing to back up the claims, as TargetCW, the company that contracts Uber’s brand ambassadors requires them to sign a strict non-disclosure agreement about the program. Ryan Graves, Uber’s head of global operations challenged The Verge’s story today, saying that “Competition is fair. Are we aggressive? For sure. But not dirty,” and that he believes the SLOG program is entirely justified. It appears that Uber started the SLOG program as an aggressive marketing tactic to recruit as many drivers as possible, but it may have escalated out of its own control. While Uber claims to not have allowed recruiters to cancel rides, its own documents imply that ambassadors cancel Lyft rides if they get the same drivers. Uber can continue to maintain that its tactics are within the bounds of fair competition, but from what we and The Verge have seen, the company has crossed the line.